“Bag-on-valve” (BOV) aerosol development has made possible a large number of sophisticated skin moisturizing products able to compete with the various non-pressurized versions. With the added elegance of shaped aluminum cans and easy-press spouts, they have done well in the marketplace. It may come as a surprise to some that a majority of U.S. adults (mainly women) now apply moisturizers to face and hands on a daily basis. The result is a $50+ million per year market. Retail prices, usually $5 and up, are pleasing to marketers. Dry skin (xerosis) is ubiquitous. It ranges from an occasional winter-driven rash to disfiguring, flaky “sandpaper skin,” where persistent itching and scratching is apt to cause multiple bleeding sites. The malady is usually most intense on the arms, lower legs and neckline areas, but the face and scalp may also be impacted. Dry skin affects virtually 100% of the elderly in northern latitudes, sometimes with devastating effects. 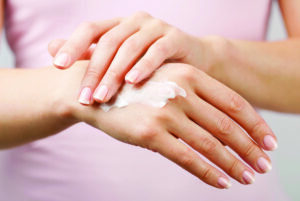 The majority of U.S. adults apply moisturizers to face and hands on a daily basis. The usual aerosol product has around 10 to 12 chemical ingredients. About one to three can be considered as “active ingredients,” such as the film-forming polymers in a hair spray or the fragrance in an air freshener. In contrast, skin moisturizers generally contain dozens, even scores, of “active ingredients.” A recently published example is a French moisturizer that contains 83 ingredients, including nine emollients plus numerous sunscreen agents, free radical scavengers, vitamins, herbal extracts, hormones and other items. Unfortunately, it was regarded by consumers as being too greasy. In the U.S., skin moisturizer formulations typically contain from about 18 to 46 ingredients. The rational for including so many can range from scientific testing results to impressing some potential consumers with product labels that carry a long list of ingredients. Savvy marketers recognize that new and improved skin moisturizers are demanded by better educated, more critical consumers who usually have more disposable income. They want skin products that do more than simply keep the epidermis (stratum corneum) smooth, soft and free from itching. Consequently, numerous specialized ingredients are now added to the basic moisturizing matrix in an effort to produce “super skin care” products. The benevolent effects of skin moisturizers begins to fade rapidly after about four hours, faster in hot sunlight and slower if applied after washing or showering, when the skin is already moisturized and the products can lock-in that extra moisture content. This has encouraged many users to apply these products during both morning and evening hours. 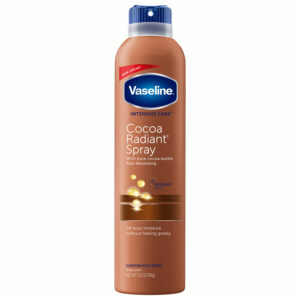 Vaseline Intensive Care Cocoa Radiant Spray Lotion has a non-greasy, non-sticky formula to leave skin soft and fresh. With micro-droplets of Vaseline Jelly, the lotion spray moisturizes and absorbs in seconds to help heal dry skin. In formulating skin moisturizers it has been suggested that a few smaller marketers may consider composites of the qualitative published formulas of major firms, quantifying the ingredients in line with well known and customary practices. However, larger marketers will often devote thousands of hours of research to the sophisticated testing of prospective formulas. The testing process can take the form of mechanical/electrical equipment assays and the use of human volunteers. About 50% of woman and 30% of men have what they consider to be sensitive skin, so volunteers with both “normal” and sensitive skin must be considered. Others will be allergic, especially to fragrances and sometimes to preservatives, and testing should include Allergic Contact Dermatitis assays for this volunteer group (a number of major skin moisturizing products are now fragrance-free). Since these products are used in a repeatedly “leave-on” fashion, the possibility of skin irritation and dermal sensitization must be tested. The work can be done if the marketer has an adequately equipped bioengineering laboratory or by professionals in clinical testing firms. A common patch testing site is the outer (often hair covered) areas of the forearm. Standard testing protocols are available, such as the Acute Skin Irritation Test, the Cumulative Skin Irritation Test and the Sensory Irritation Test. Aside from these volunteer-based tests, subjects must evaluate the application vectors. They include initial skin feel (tactile smoothness and product uniformity); intermediate skin feel (hopefully minimum tackiness as water in the emulsion evaporates) and final skin feel. Since aerosol moisturizing products are packaged in BOV dispensers, where the bag is 100% filled with product, the emulsion must never stratify into oil and water phases, even after a year or more. If any separation does occur, no amount of shaking will reconstitute the layers—even temporarily. To avoid these potential problems, skin care formulas contain emulsion stabilizers, often typified by having long chain structures. For example, xanthan gum (produced by bacterial action) consists of a cellulosic core with trisaccharide side chains. Although water-soluble and approved for foods, the polymer also has emulsion and thickening properties. 0.10% Dimethicone (AS D-C 200 Fluid–100 cstks. While this is an untested formula, perhaps requiring the tweaking of percentages for optimum results, it contains all the types of ingredients currently popular in existing skin moisturizing products. This includes humectants, emulsifiers, emulsion stabilizers, a thickener, preservatives, a film former, a chelating agent, skin fresheners, fragrance and a collagen prototype skin de-wrinkling agent. Those with molecular weights of about 4,500 daltons or less are generally able to penetrate the 10–20 micron thick stratum corneun (SC) and reach the underlying and much thicker stratum granulosum (SG), for added efficacy. The result is tactile smoothing and a plumping of the skin. 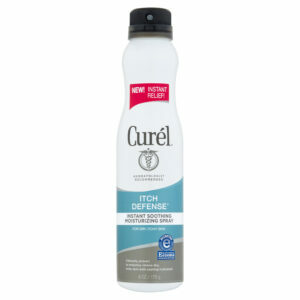 Curél Itch Defense Instant Soothing Moisturizing Spray with Advanced Ceramide Complex restores skin’s ceramide levels to help retain moisture and prevent symptoms of dry, itchy skin from returning. The formula rebalances the four components of healthy skin: ceramide levels, pH levels, moisture level and cellular turnover. Dry skin is caused when dermal moisture evaporates faster than the rate at which it can be replaced. A new equilibrium is then established where the skin moisture content is only a fraction of the normal level. In turn, this leads to skin that is bumpy, flakey and itchy. It can be quite unsightly. Skin moisturizers (humectants, emollients) form temporary lipid films on the skin surface and below that act to diminish the rate of evaporative water loss. 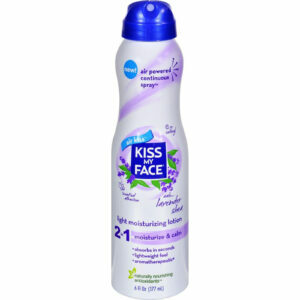 Despite its name, Kiss My Face Light Moisturizing Lotion with Lavender & Shea Butter is for the body. The calming Lavender Shea formula is blended with nourishing antioxidants to help soften, hydrate and soothe skin. 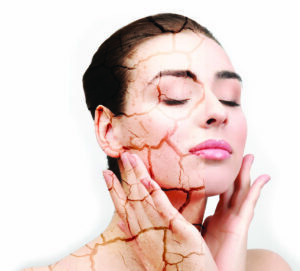 A key aspect of dry skin dermatology is Transepidermal Water Loss (TEWL). Instruments such as the Tewaneter TM 300 measure TEWL and thus the barrier function of treated versus untreated skin. From these, the efficacy of the skin moisturizer can be determined as soon as the film dries and for several hours thereafter. This is an indispensable assay in formula development work. A fair number of instruments are now available for TEWL studies; each has its own “personality.” They replace the taped-on patch tests, where pre-weighed absorbent pads are applied to fixed areas of treated and untreated skin area. On removal they are immediately checked for moisture content using a Karl Fisher assay (a classic titration method in analytical chemistry that uses coulometric or volumetric titration to determine trace amounts of water in a sample). For reproducible results, volunteers should be stationed in constant temperature and humidity chambers. More sophisticated clinical laboratories may back up TEWL studies with chemical patch tests, typically on the hairy (volar) forearm of subjects. In one, up to 0.10% solutions of sodium lauryl sulfate (SLS) are applied for 24 hours (SLS is a well know mild skin irritant). The treated skin is then checked for erythema, either visually or with a quantifying device, such as a Minolta Chromameter (Moorman Instruments). A low vascolar response suggests good protection. Other chemicals, such as sodium hydroxide (NaOH) and dimethyl sulfoxide (DMSO), have also been utilized. Perhaps the most persuasive tests involve applying prospective products on volunteers and noting the results, both visibly and tactically over several weeks. Ideally, the treated dry skin should lose its rough texture and flakiness without the skin becoming irritated, sensitized or otherwise traumatized. The product should spread on the skin smoothly, without giving the consumer any sensations of stickiness, greasiness, coloration or shine. It should dry rather quickly, without causing consumers to unduly delay putting on their clothes. Some products promise significant improvement of skin texture in five days. The human skin will vary from “normal” to “sensitive” to “highly sensitive” in terms of cosmetic intolerance syndrome. About 5% of women have significant subjective sensory irritation problems. They must be very careful when purchasing soaps and other cosmetics since many products will cause stinging, redness and other forms of irritation about an hour after application. In Germany, Duschdas Spray & Go Body Lotion from Unilever comes in Cucumber & Waterdrops, Honeymelon & Jasmine and Chocolate & Coconut. The aluminum can is from Tubex. Several are utilized in commercial products, but likely in low concentrations and with their inclusion supported by human testing on hyper-sensitive dry skin volunteers.